Floating home on scenic bay w/ deck - perfect for water sports! Property 4: Floating home on scenic bay w/ deck - perfect for water sports! Shag Shack II, A Unique Vacation Experience! Property 8: Shag Shack II, A Unique Vacation Experience! April. Book 2 nights get third night free !! Property 12: April. Book 2 nights get third night free !! Best Kept Secret! House Boat 70' Has Everything! Property 16: Best Kept Secret! House Boat 70' Has Everything! Pirate Ship Adventure cabin! Near Dells! Sleeps 6- Arrgh Maties! Property 17: Pirate Ship Adventure cabin! Near Dells! Sleeps 6- Arrgh Maties! Floating Cabin On the Water... Fish out your front door! Property 25: Floating Cabin On the Water... Fish out your front door! Stay On-board a 42 Ft. Sail Boat in the Keys near Key Largo. 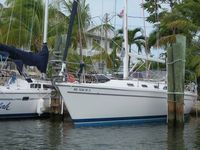 Property 26: Stay On-board a 42 Ft. Sail Boat in the Keys near Key Largo. BEST VIEW ON NORRIS LAKE-- boat required to access this property! Property 27: BEST VIEW ON NORRIS LAKE-- boat required to access this property! Property 33: Vintage Houseboat getaway! Boathouse on the Tickfaw River! Only Accessible by Water Across from Prop Stop! Property 39: Boathouse on the Tickfaw River! Only Accessible by Water Across from Prop Stop! Newly constructed, Bay Breeze, the Floating Cottage. Reserve your stay today! Property 40: Newly constructed, Bay Breeze, the Floating Cottage. Reserve your stay today! Spacious Floating Condo on the water with all upscale amenities. Property 45: Spacious Floating Condo on the water with all upscale amenities. Newly Renovated Houseboat in Hopedale, LA on Bayou Loutre. Property 49: Newly Renovated Houseboat in Hopedale, LA on Bayou Loutre. Had a great time here! Stayed four nights in April - Just my husband and me, so we had plenty of room here! I always wake up early and really enjoyed taking my coffee out to the front deck and watching the sun come up. The location is handy to restaurants &amp; stores, and it was really quiet most of the time - had fun waving to the folks on the fishing and diving boats that would go by. The huge smart TV with all its streaming choices was very nice late in the evenings. We fished off the boat a few times and my husband caught a 5' nurse shark, that was fun! From the moment we found the Northern Cross rental on Homeaway New Year&rsquo;s Day, to the communications leading up to and during our stay, to the very last minute we were leaving the parking lot to return home &hellip; everything we imagined came true and then some! The &ldquo;live aboard&rdquo; experience was exactly as advertised. And, having Captain Paul as our &ldquo;tour guide&rdquo; was beyond our wildest dreams &hellip; Fishing, Snorkeling, Sunset Sailing, Exploring the Mangroves, and Feeding the Tarpon at Robbie&rsquo;s. We had great seafood meals and entertainment at Snapper&rsquo;s, Lorelei, Lazy Days, Wahoo&rsquo;s, and Hog Heaven, all at Captain Paul&rsquo;s recommendation. The location was perfect to charter for a day of Deep Sea fishing out of Islamorada. And, we made it into Key West for a Jet Ski tour, History lessons, Tropical drinks, &ldquo;Half Shells&rdquo; and Hot Dogs at &ldquo;Island Dogs&rdquo;. We were &ldquo;Lucky Enough&rdquo; to experience a lifetime of memories in our week spent on the Northern Cross &ldquo;Living on Blue Waters&rdquo;. Thank you Rick, Tony, and Captain Paul for sharing your boats and love of the Florida Keys with this Father, Son, Uncle and Aunt.